Proceeds from sale of the light strands to benefit Deltassist’s Christmas programs. Delta firefighters are hard at work bringing a little Christmas magic to the heart of the community. 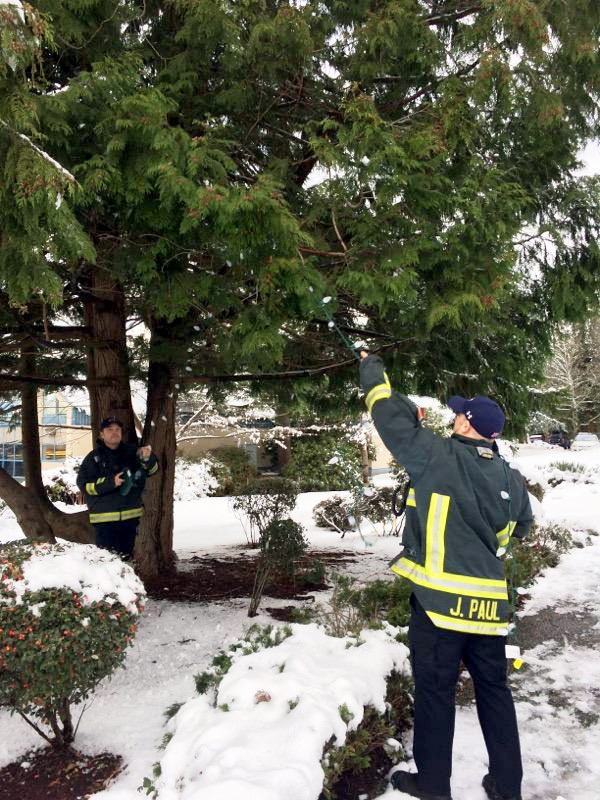 On Sunday, Dec. 11, Delta Firefighters along with Mayor Lois Jackson, Delta North MLA Scott Hamilton and community sponsors will be lighting up the large tree and corridor next to George Mackie Library on 84th Avenue for the holiday season. Hamilton, who had participated in many tree lighting ceremonies in South Delta during his time on municipal council, said credit for this event should go to his wife Kristen. A phone call to the mayor later and the ball was in motion for the first (hopefully) annual Christmas tree lighting in North Delta. Hamilton said he was inspired to involve the Delta Firefighters Charitable Society and turn it into a fundraising opportunity after a drive through Downtown Vancouver around the same time. The Delta Firefighters Charitable Society in turn settled on Deltassist’s Christmas programs as the beneficiary of any funds raised. The society is selling strands of lights for $200, and donors will be acknowledged on its website, social media and, for those who donate $200 or more, on the electronic display board outside the library. Donors will also receive a charitable donation receipt. Delta Firefighters will spend the week decorating the corridor next to the library in preparation for the official lighting ceremony on Dec. 11. The event will run from 6:30 to 8 p.m. with the official lighting taking place at 7:15 p.m. The event will take place in George Mackie Library parking lot (8440 112 St.) with hot chocolate and treats provide by the North Delta Rotary Club, candy canes handed out by firemen, hotdogs and hamburgers from M&M Meats and an area for children to mail letters to Santa and music. Although this is the inaugural tree lighting in North Delta, Hamilton said he has high hopes for the event’s future. “This is the year of it’s birth and hopefully in years to come we’ll have a little more time to spend on it and we can do a little more fundraising and make it an annual event,” he said. To donate, visit the Delta Firefighters Charitable Society website at deltafirefighters.com. For more information on Deltassist’s Christmas programs, including suggestions for stocking stuffers and gifts for teens, visit deltaassist.com/community/christmas-toy-drive-and-food-hampers.